Shirley Kujawa Weller was born May 24, 1924 in the small northeast Iowa village of Marquette. She graduated from high school in 1941 at the age of 17. When World War II broke out, she wanted to enlist in the Women's Auxiliary Army Corps (WAACs), but at her age parental consent was required, and that was not forthcoming. So, during the war years she worked at various clerical jobs in northeast Iowa. In the fall of 1945 Staff Sergeant Everett Weller returned home to the neighboring town of McGregor after distinguished service in Normandy and beyond. Everett and Shirley happened to attend the same wedding that fall, Shirley as friend of the bride, and Everett as best man for the groom. The two of them renewed a casual acquaintance from before the war, and it quickly blossomed into romance. By the end of November they were engaged, and on February 11, 1946, Shirley became Mrs. Everett Weller. Shirley thus became an Army wife, and from 1946 to 1964, she lived at no fewer than 18 addresses, encompassing six states and two foreign countries (Germany and Taiwan). In each of these places she and Everett solidified the idea that "home" in the service is not a place, its people who care about you. Thus, whenever they arrived at a new posting, one of the first things they did was to find a church home. This idea was impressed on their children: Stephen, born in 1948, and Barbara, born in 1954. Whatever the address, family ties were important, and love was obvious. The Weller family joined Glen Burnie Baptist Church in the mid-1960s. Wherever they lived, Shirley enjoyed decorating the house using her considerable sewing talent. 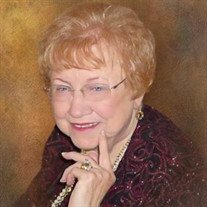 Other hobbies included playing the piano, reading and playing cards, which she frequently did at the Pascal Senior Center. During the Reagan and George H. W. Bush terms Shirley enjoyed volunteering at the White House. Thanks for everything, Mom: your encouragement, your gentle hands clasped in ours, and your caring spirit. Our memories of you will live in our hearts. She was preceded in death by her beloved husband, Everett H. Weller and her sister, Elma Reetz. Shirley is survived by her two children, Stephen Weller and his wife, Janet; Barbara Clarke and her husband, Steve; her grandchildren, Stephanie Furry (Christian), Matthew Clarke (Allison) and Tim Clarke (Patrice); her great-grandchildren, Alex, Dylan, Carter, Tanner, Madeline, Everett, Graham and Harvey.